The absolute tragedy of malgovernance and suffering that is North Korea [and] that will probably continue for some time yet despite the death of Kim Jong Il does serve as probably the most convenient illustration imaginable of the importance of political and economic institutions in shaping human destiny. 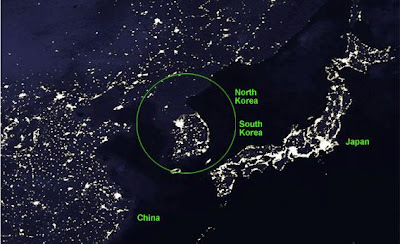 North Korea and South Korea have similar geography, similar culture, similar racial/demographic issues, and totally different economic output thanks overwhelmingly to completely different political systems. Actually, their social and economic systems are also dramatically different, not just their political systems. But in an ultra-Stalinist totalitarian dictatorship like the one ruling North Korea, all those dimensions are part of one package. So in that sense Yglesias's formulation is basically right. Lest one imagine that North Korea has simply found a way to solve the problem of light pollution, the economic contrast between the two Koreas is also vividly captured by the following graph (from here). Admittedly, economic estimates for a closed society like North Korea involve a fair amount of guesswork. But my impression is that the assessments here broadly accord with the consensus of serious analysts. Today, North Korea has the awful distinction of being the only literate and urbanized society in human history to suffer mass famine in peacetime. And North Korea's hunger problem continues to this day: Pyongyang has relied upon "emergency" international humanitarian relief for over a decade and a half. Earlier this year the DPRK lodged an urgent appeal to the United Nations World Food Program (WFP) for another round of food aid. 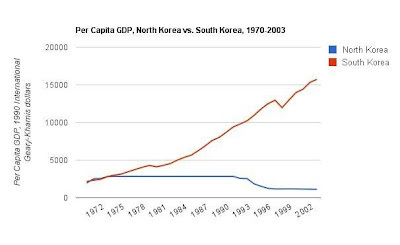 North Korea is thus the world's first and only industrialized economy to lose the capacity to feed itself. Even if North Korea were more prosperous, it would still be a horrifically repressive totalitarian police state, the closest contemporary equivalent to the world depicted by Orwell in 1984, ruled by a semi-deranged power elite. 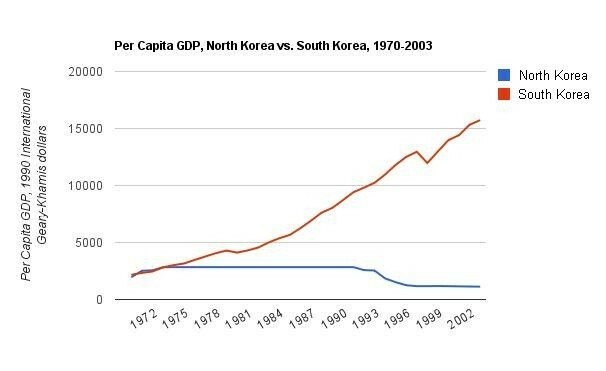 But in addition, North Korea's experiment in totalitarianism has been a spectacular failure in economic terms. If any of this sounds exaggerated, it's not. Nor is it easy to imagine optimistic scenarios for the foreseeable future. There is no reason to believe that the North Korean regime has either the desire or the capacity to effectively reform itself. And the dysfunctional character of the regime is, perversely enough, one of its key assets in its strategy of international brinksmanship. The current situation, in which an unpredictable, paranoid, and deliberately erratic regime armed with nuclear weapons rules over an impoverished, terrorized, and isolated population, is scary enough. But what really scares North Korea's neighbors out of their wits is the prospect that this horrible regime might collapse, unleashing a tidal wave of refugees and requiring the reconstruction and recuperation of a devastated and deeply distorted society. That will be a crushing burden in economic terms alone, and nobody is eager to take on the task. South Korea, in particular, would prefer not to think ahead to this situation, even though it is very likely to materialize within a generation.